Price: Call 604-261-2525 for more info on prices including installation. Outdoor Heaters and patio heaters provide heat for you during the summer evenings and can extend your outdoor entertaining earlier in the spring and later in the fall. 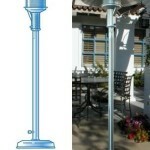 Outdoor heaters use infra-red heat to heat the object and not the air. These heaters stand on their own with a weighted base. They can be moved around depending on your seating arrangement and depending on the outdoor temperature. These heaters are permanently mounted to the ceiling or wall. They are directed toward a specific area and generally cannot be moved.